The word mudra ("seal" or "sign") is associated with symbolic gestures or poses of the hand and fingers. This statue displays the Abhaya mudra indicated by raising the hand, palm facing outward in front of the chest. The left hand hangs down at the side of the body. 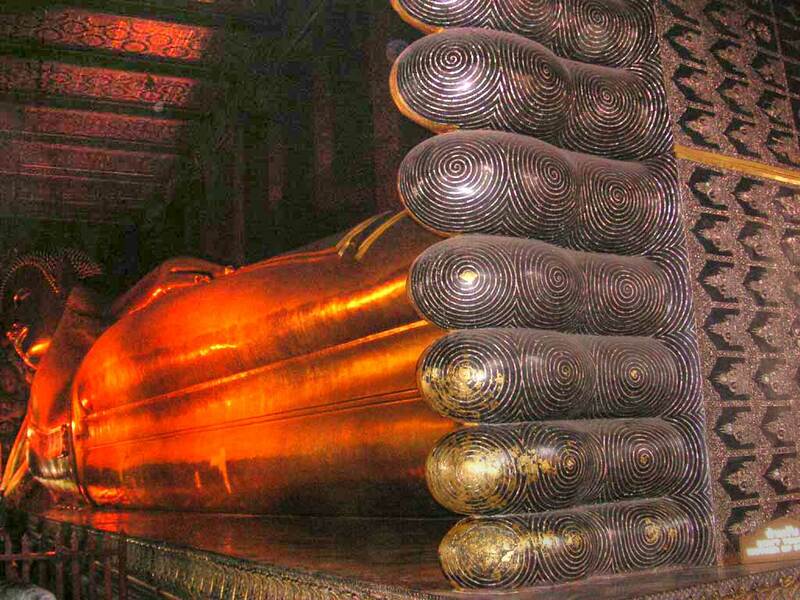 In Thailand, and especially in Laos, this mudra is associated with the movement of the walking Buddha (also called "the Buddha placing his footprint"). 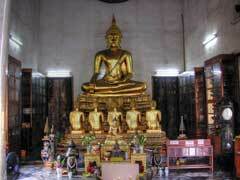 It is nearly always used in images showing the Buddha upright, either immobile with the feet joined, or walking. It represents granting protection of dispelling fear. 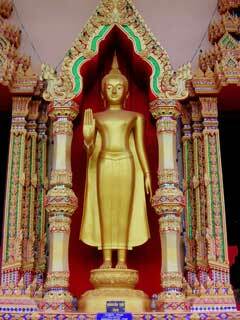 This statues displays the Bhumisparsha mudra, "earth-touching", the distintive emblem of Buddhism. 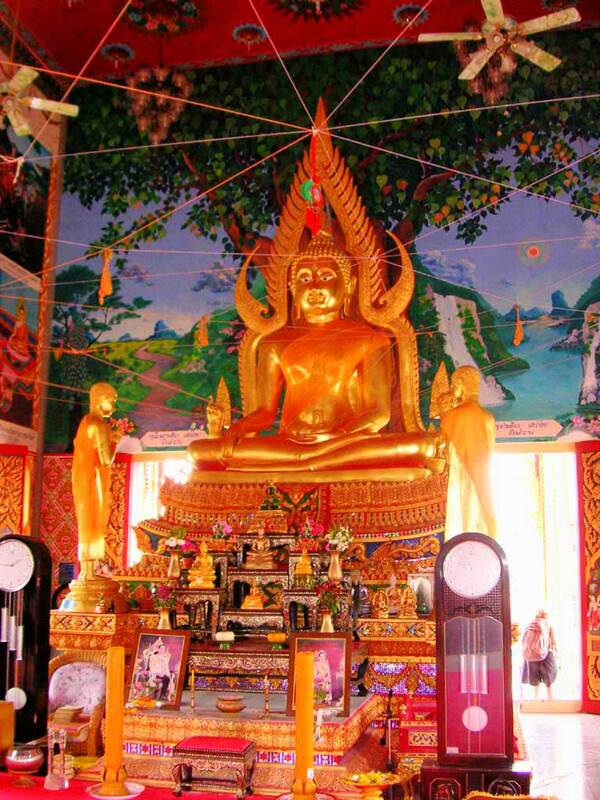 The seated Buddha's right hand touching the ground to call the Earth Goddess to witness his victory over Mara, and therefore sybolizing his achieving enlightenment. The left hand lies on the lap with palm upward. The white string is called sai sin. It is plain cotton string that has been blessed and is placed to keep out evil spirits and protects everyone and everything inside it. Sai sin is often seen outside temples and is used in house blessing ceremonies, funerals, and "wrist binding" (Sai sin is tied to your wrist). Notice the picture of the King and Queen at the base. 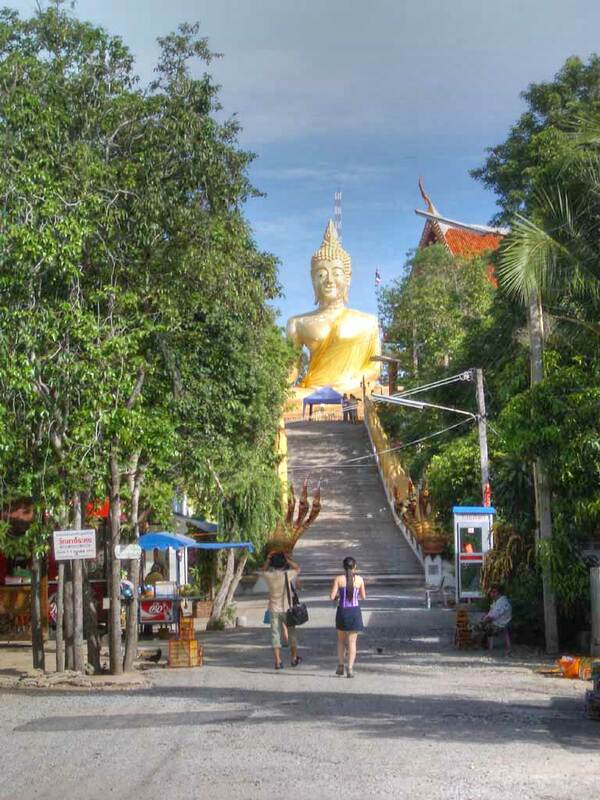 The Big Buddha was built on the northern side of Koh Samui in 1972. It is about 40 feet tall and is visible for miles. 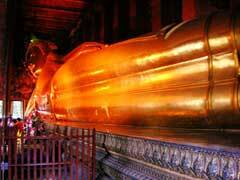 The Reclining Buddha is enormous. 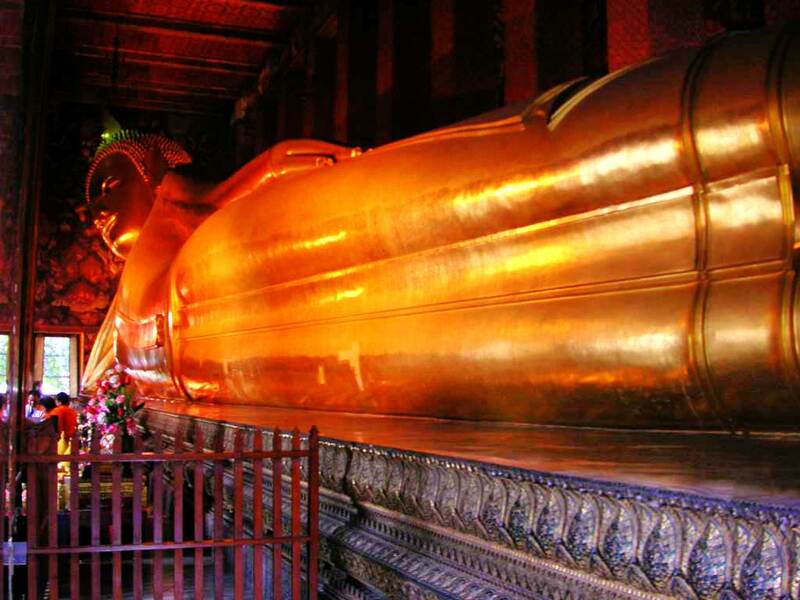 It is 138 feet long and 45 feet high, and represents the passing of the Buddha into nirvana. The eyes and feet of the Reclining Buddha are made from mother-of-pearl. 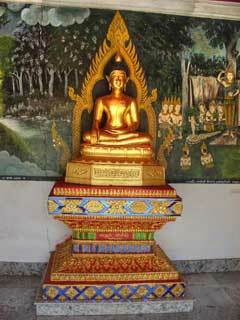 The feet are 9 feet high and 15 feet long, and show the 108 characteristics of the Buddha. 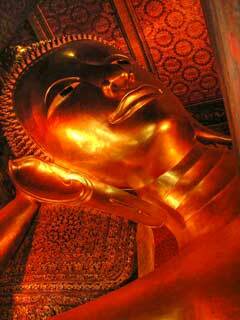 Notice the elongated ear lobe caused by the elaborate earrings the young Prince Siddhartha wore. The long earlobe is a reminder that Buddha was once dragged down by wealth, but his earlobes are now empty because he renounced the wealth. 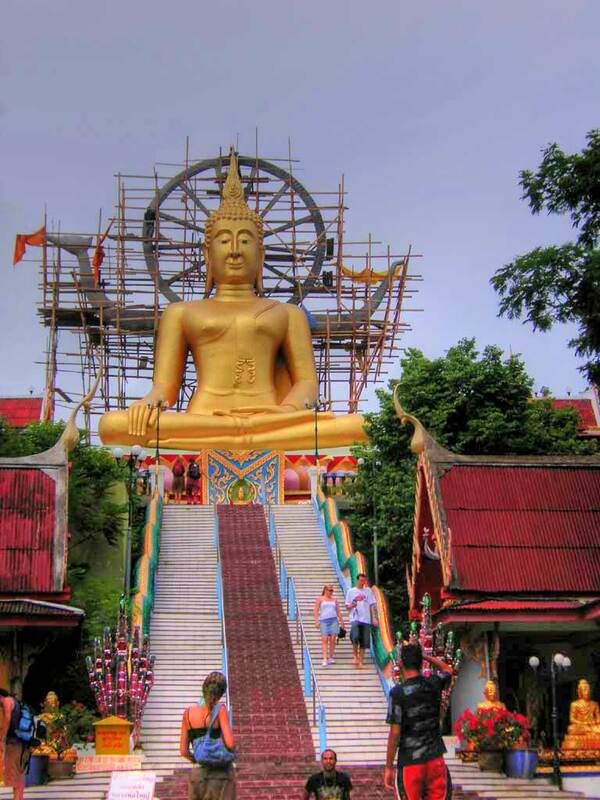 The grounds of Wat Pho contain more than 1,000 Buddha images, most from the ruins of the former capitals Ayuthaya and Sukhothai. In the South Vihara there is an image of Lord Buddha giving the first sermon to the five disciples in Benares. 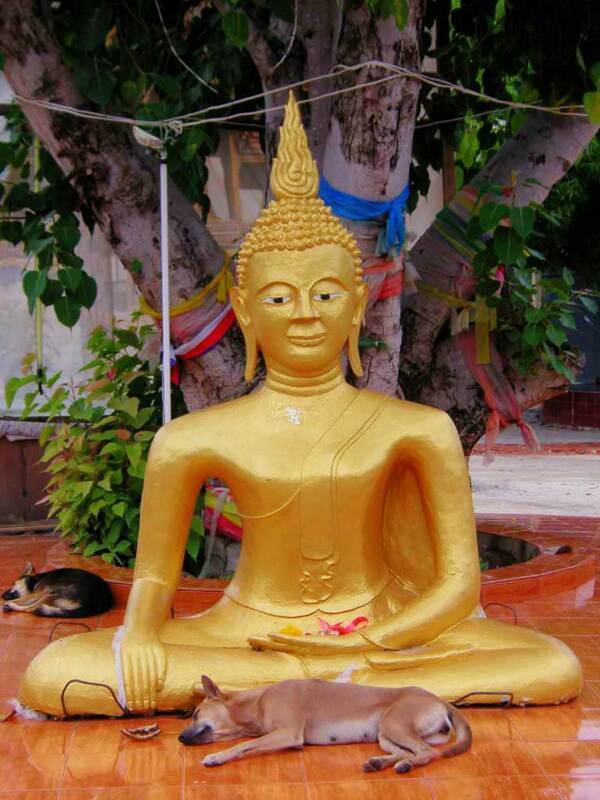 In his first sermon he teaches them what will become the gist of Buddhism. Upon hearing it, one of the disciples instantly attains the status of an arhat (one with enlightened wisdom). This event marks the beginning of the Buddhist teaching and his disciples become the first five members of the sangha (Buddhist monastic order). 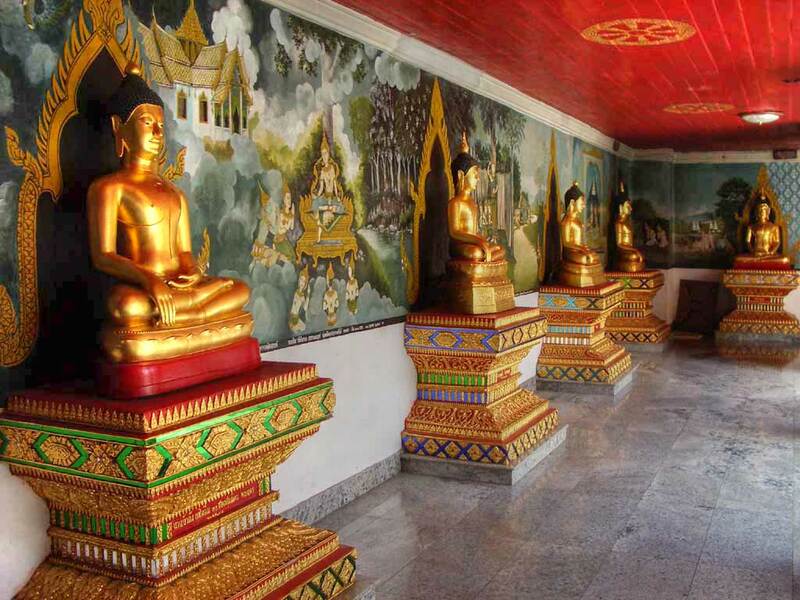 The inner side cloister contains 150 Buddha images with another 244 images being located on the outer side. These images were brought fom northern provinces during the reign of King Rama I.
Wat Phra Borommathat Doi Suthep is on Doi Suthep, 3,520 feet above sea level, 15 kms. from town. 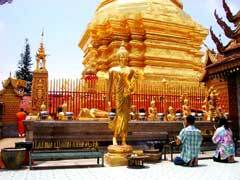 Phra Borommathat Doi Suthep is a large golden pagoda in the center of the temple containing a part of the holy relics of the Lord Buddha. It is holy spot visited throughout the year by Buddhist pilgrims from all over the world. This temple was built by King Gue-Na in 1383 A.D. This statue displays the Dhyana mudra representing meditation. The two hands rest together in the lap, usually right atop left. 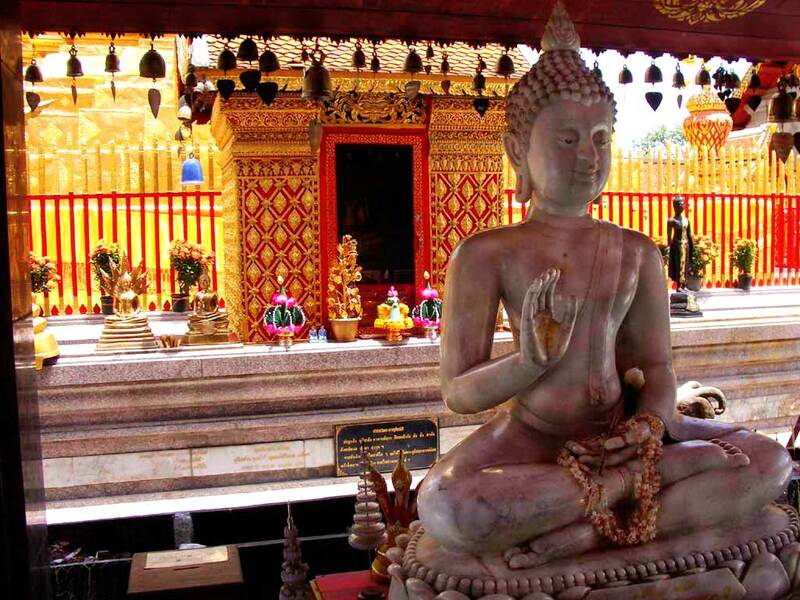 This statue also displays Muchalinda, a gigantic serpent-genie, known as a "Naga" who dwelt in the roots of the Bodhi Tree under which the Buddha attained Nirvana. 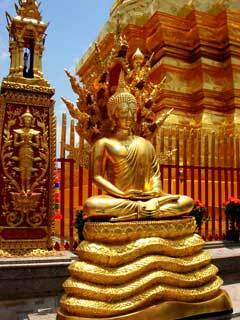 Muchalinda saved the meditating Buddha from a storm by winding his coils around him, thus shielding the Buddha until the tempest had passed. 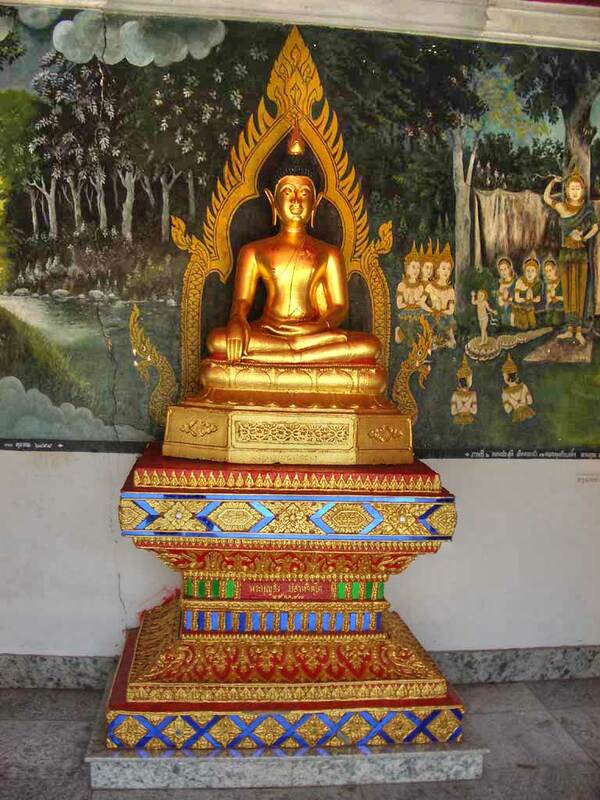 This statue shows the Buddha sitting on a pedestal called Vajrasana (Diamond Throne) on top of the coils of Muchalinda, with Muchalinda's seven-headed hood overhead as a protective canopy to deflect the rain. The large statue of the standing Buddha in the middle displays the Vitarka mudra representing teaching, intellectual arguement, or discussion. The hand is raised in front of the chest with the index finger and thumb touching. Sunday "Seven Days Looking" (Paang Tawai Netr), the image is standing with hands held down in front of the body. The left hand is covered by the right. 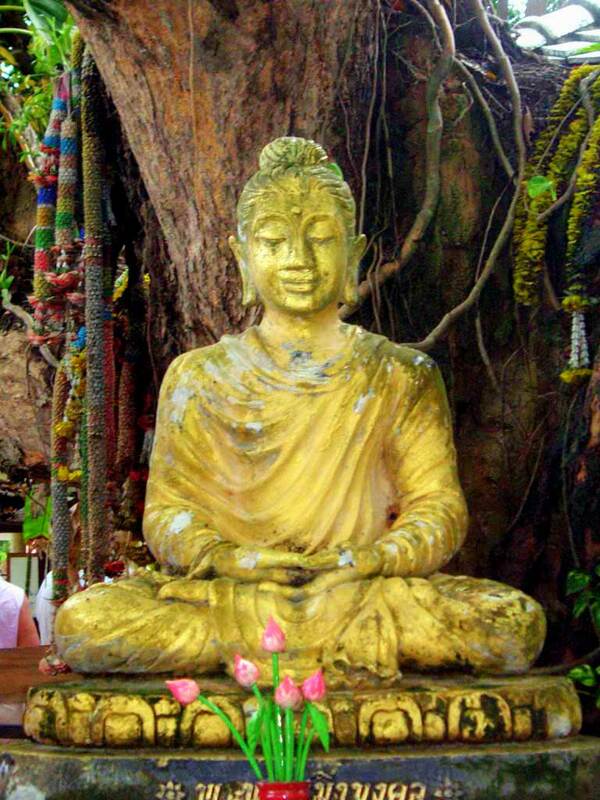 This attitude represents the period after the Buddha had realized Enlightenment. 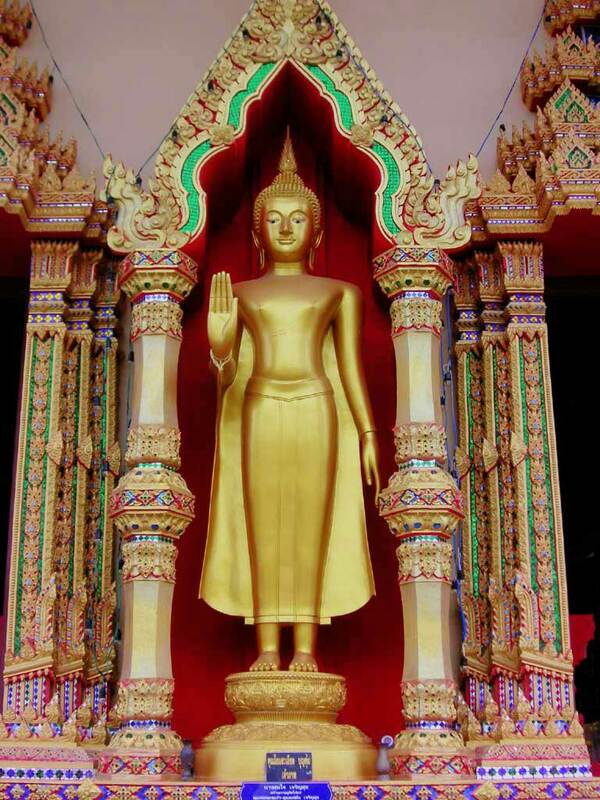 Monday "Pacifying the Relatives" (Paang Harm Samoot) is a standing image with right hand raised; this was the posture of Buddha when he persuaded disputing family members to peacefully compromise. 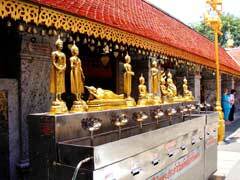 Tuesday "Realizing Nirvana" (Paang Saiyasna), the image, reclining on the right side, toes even, indicates his death. 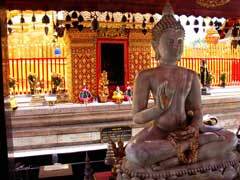 Religious texts state that the Buddha entered parinibbana on this day of the week. Wednesday (Paang Oombaat) A standing Buddha image holding an alms bowl. Thursday "The Meditating Buddha" (Paang Nung Samadhi) in a sitting pose is a reminder of the classic posture for meditation. The full lotus with both soles upward and visible, the hands resting in the lap, right above left with all fingers extended, palms upward. Friday The "Contemplating Buddha" (Paang Rum Peung) stands with hands resting across the chest, the right hand covering the left. The pose implies a complete spiritual transformation. Saturday "Protected by the Naga King", (Paang Naga Prok) the Buddha image sits on a large coiled serpent which rises to protect him from a raging storm. I'm not sure what the last two represent. The Temple of the Emerald Buddha is the most sacred structure in the Kingdom and the repository of the spirit for all the Thai people. The history of the Emerald Buddha itself dates back more than 600 years and also represents the struggle of the Thai people to maintain their independence from foreign aggressors. 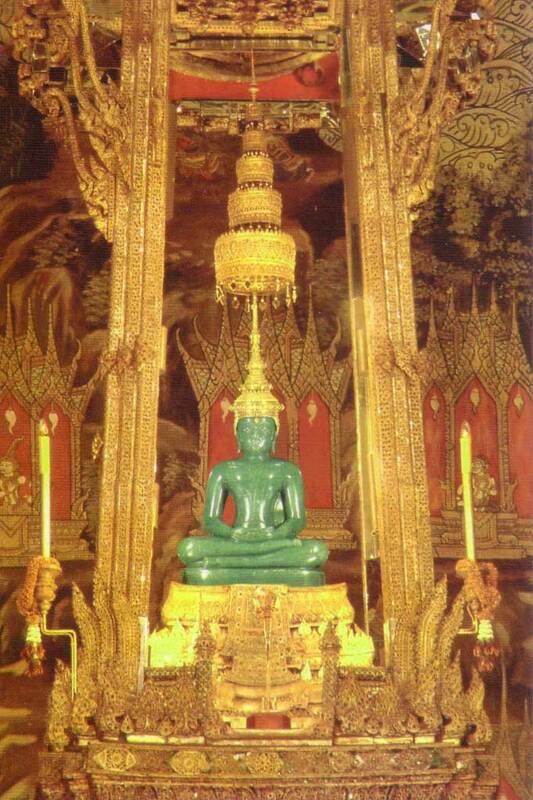 "According to the prehistoric legend in the oldend days it was told that the Emerald Buddha was given by a King of Gods to Nagasena of Pataliputara. 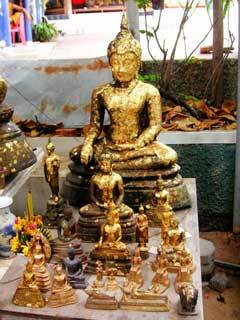 He then magically put seven pieces of the Buddha's Holy Relics in the image. It was also told that the image was built in B.E. 500 (B.C. 43) Its age now more than 2000 years. 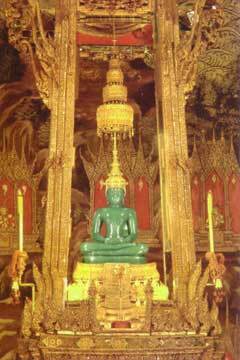 The Emerald Buddha's lap is 48.2 centimeters long its height from the base to the top of its head is 66 centimeters. The crystal belongs to the monoclinic system in the paroxene group. Its hardness is between 6.5 and 6.7 and its Specific gravity is between 3.33 and 3.35. It has been in the temple of the Emerald Buddha since March 22, 1784 [B.E. 2327]"
The Emerald Buddha in winter season attire (December through March). The Emerald Buddha itself is simply the jade statue, but it is adorned with garments made of gold. There are three different sets of gold clothing, which are changed by the King of Thailand in a ceremony at the changing of the seasons - in 1st Waning of Lunar Month 4, 8 and 12 (around March, July and November). 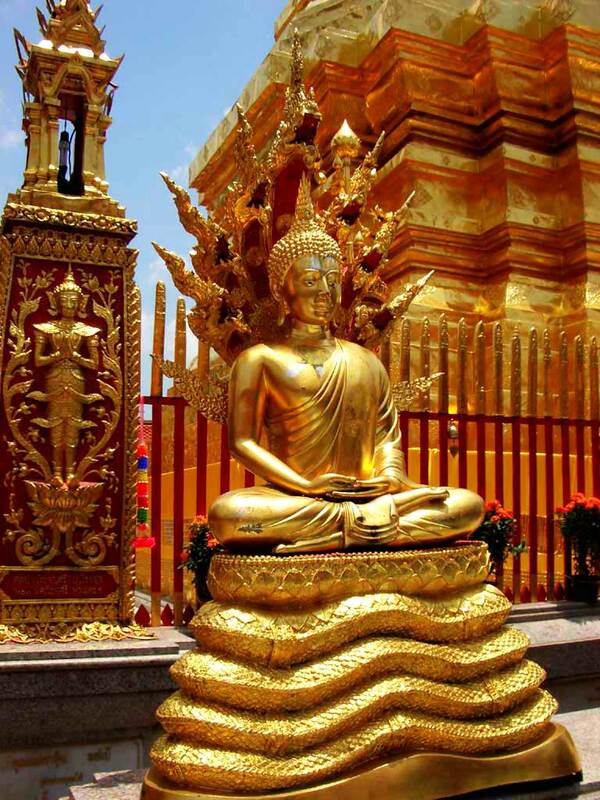 The three sets of gold garments correspond to Thailand's hot season, rainy season, and cool season. The two sets of gold clothing not in use at any given time are kept on display in the nearby Pavilion of Regalia, Royal Decorations and Thai Coins on the grounds of the Grand Palace, where the public may view them. 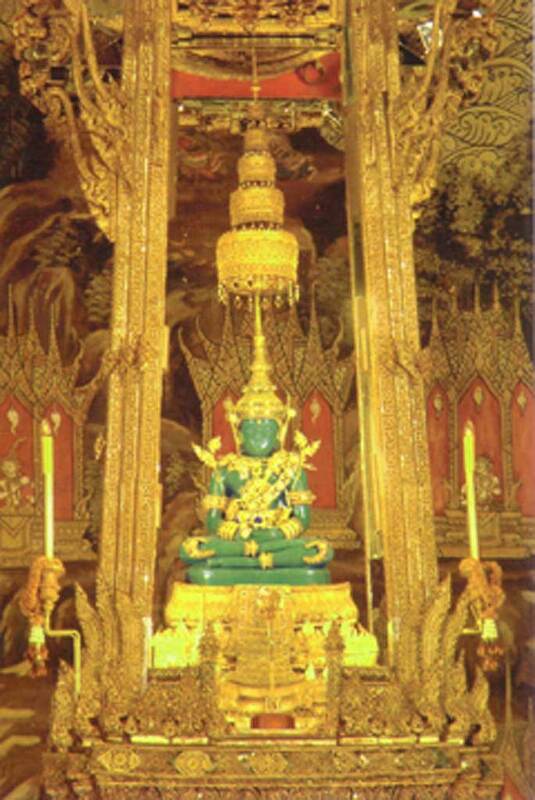 The Emerald Buddha in summer season attire (April through July). 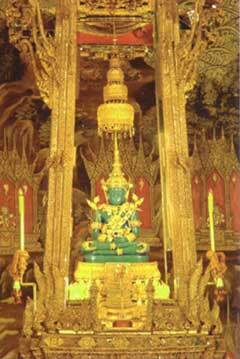 The Emerald Buddha in rainy season attire (August through November).